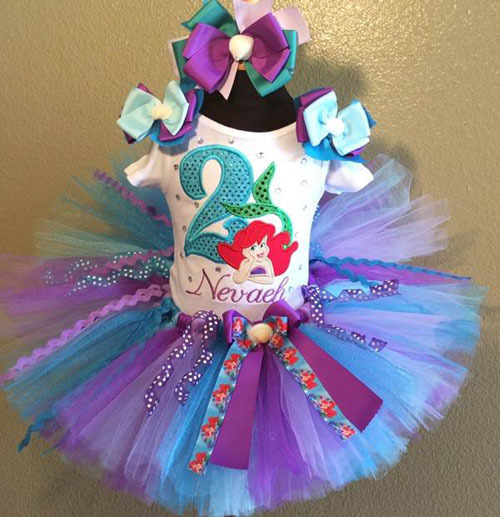 This adorable little mermaid inspired handmade inspired birthday girl tutu set comes with the tutu, embroidered and personalized top and the matching clip headband. The tutu is made of 100% soft nylon diamond weave wedding tulle, in shimmer tulle. It has close to 100 yards of tulle in order to create a very full tutu. The tutu is sewn onto elastic for extra durability, and because of the way I sew my tutus it allows room to stretch another 5-6 inches so your little one can wear it for a long time to come. 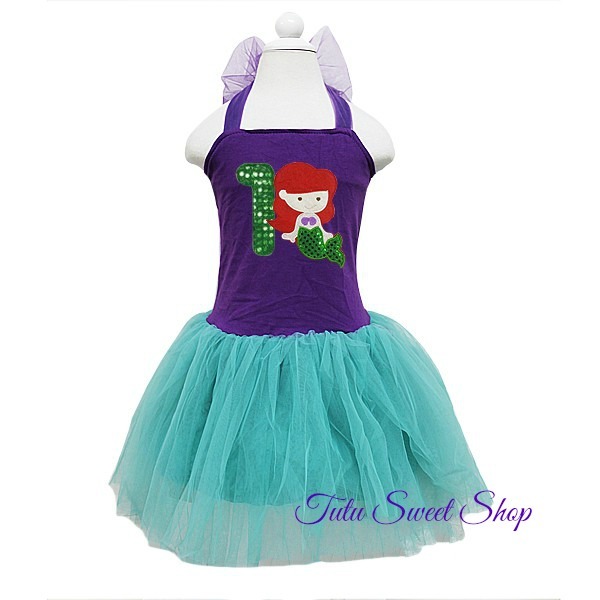 The tutu has a large print satin bow at the waist ( while supplies last, then it will be replaced with another bow), embellished with grossgrain ribbons all around it. The design is embroidered directly onto the shirt, it is not an iron-on. Rhinestones are added to the shirt for that extra sparkle if applicable. The set comes with a crochet headband with a flower on an alligator clip. It also can come with a hair bow, with satin, grossgrain, and print ribbons, and a character embellishment. The hair bow is $13 extra if you'd like to add that to your order instead of the headband...This outfit is perfect for any birthday parties or portrait sessions for the little cutie in your life. This item is custom made in the US. Please allow 3 weeks for your order to be created, plus shipping time. Rush processing is available for a custom fee.